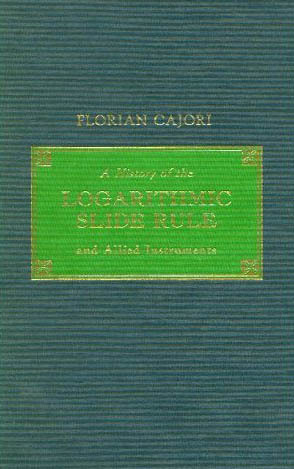 Florian Cajori's "History of the Logarithmic Slide Rule"
The slide rule, with its many variations has been vital to mathematics and engineering since its invention in the 17th century. Interest in this field has grown dramatically, unfortunately, there has been little information available except for manufacturers’ manuals and catalogs, making this reprint of Cajori’s classic particularly valuable. Also included with this reprint of the 1910 edition is Cajori’s extensive article “On the History of Gunter’s Scale and the Slide Rule during the 17th Century,” which sets forth his subsequent findings. There is also a helpful explanatory introduction by Dr. Robert K. Otnes, past editor of the Journal of the Oughtred Society.